You’ve probably heard it before… having a baby changes everything. And while I may have fully expected sleepless nights, endless laundry, buying stocks in Nabob and eating takeout more often than I’d like to admit I wasn’t expecting motherhood to affect my decisions regarding my personal style. Before having kids I naively thought of myself as someone whose children wouldn’t affect my buying decisions. I recently returned to work and noticed that what used to bring me joy now just brings anxiety. The white leather sofa I once swooned over now instills a sense of panic and disappointment. And don’t even get me started on fabric upholstery. Even I knew that fabric and kids mix as well as vinegar and water. What’s the point of buying something new if the baby is just going to ruin it or more importantly if it becomes a danger to my little one? After the initial realization that my foot loose and fancy free home furnishings purchasing years were behind me I realized that I wasn’t stuck with hand-me-down furniture until little Leiv goes off to college. I just had to make a few minor adjustments. Anyone who’s ever started a diet and exercise routine would know it’s not about depriving yourself, just about making smarter choices. With a little out of the box thinking I realized I can still have my white sofa, just in a stain resistant fabric. 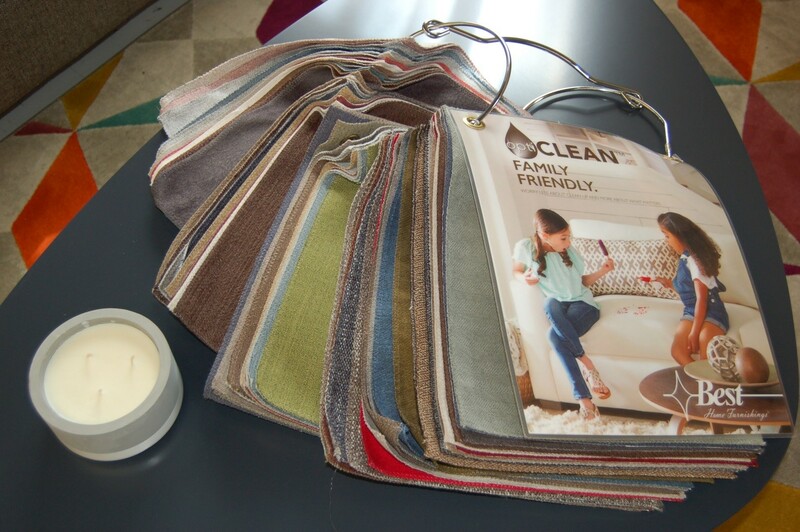 Did you know many manufacturers are offering stain resistant fabrics that you can even use bleach on? 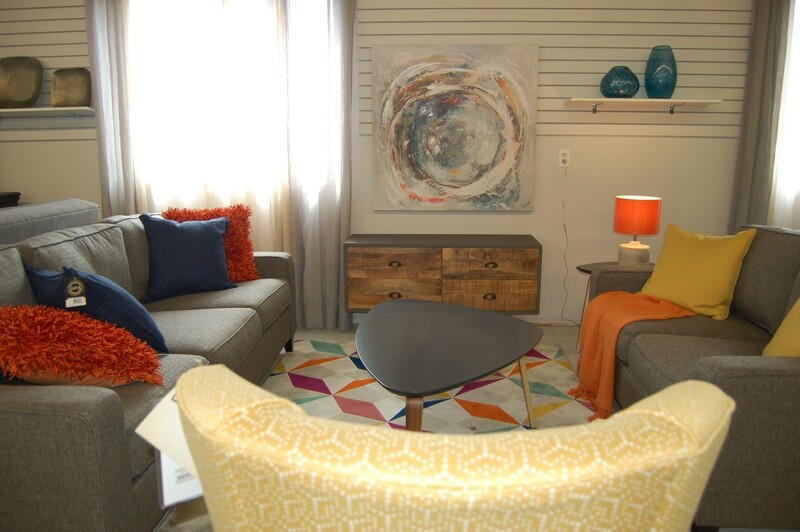 **Hint Hint** There’s a growing movement in the furniture industry to offer stain resistant fabrics. At one time your only option was to get a pricey Sunbrella set but let’s face it, a sofa made up in Sunbrella fabric looks a lot like it belongs outside on your deck not in your living room. The newest lines of stain resistant fabrics are available in a range of textures and colors that don’t leave your friends and family wondering why your patio furniture is around the fireplace. 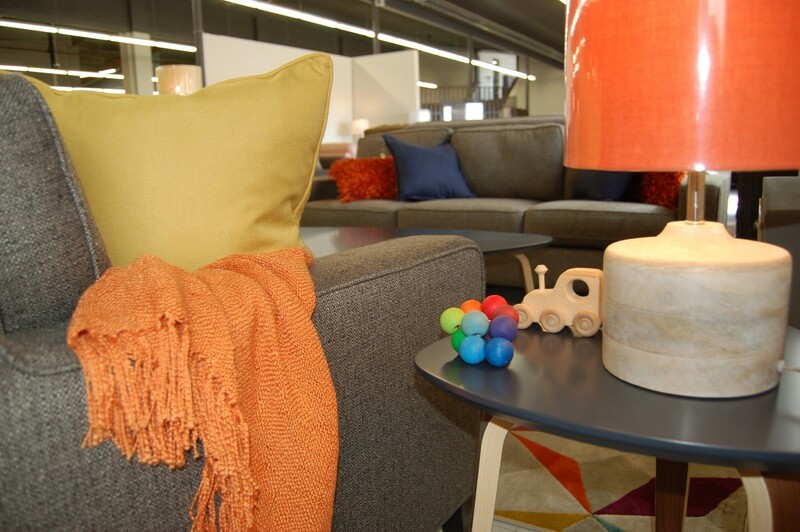 Let’s face it, round occasional tables have been a long time favorite for families with small children. Well before I started selling furniture I’d heard many a parent or grandparent grimace at the thought of kids running into sharp corners on furniture. Concerned parents have tried many different hacks to baby proof their furniture. Just one search on Amazon for furniture corner covers reveal over 4000 items you can add to your cart. From plastic corner covers to removing a piece and placing it in storage, parents will go to no length to keep that little bundle of joy safe. Heck, I have family members who have had pool noodles taped to their glass coffee table for the last 3 years. 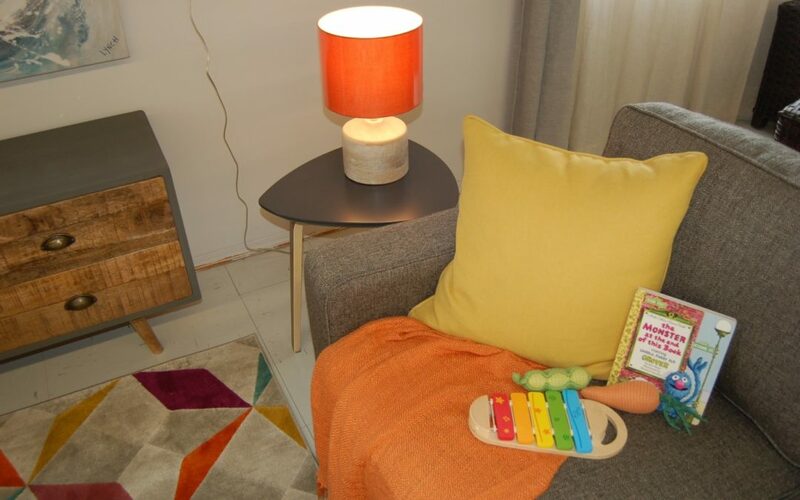 While adding plastic corners to your furniture may seem like a good idea at second glance many of these items are easily removed and can pose a serious choking hazard. If budget allows for new tables I always recommend tables in a round, oval or pie shape. Not only are curved lines safer but they almost always fit a space perfectly. Curved lines allow the eye to see past the usual square corners found on most tables, giving the illusion of more space, creating a more intimate conversation pit and never have problems with that dreaded “under sizing” rectangular tables create when positioned with a sofa and loveseat. 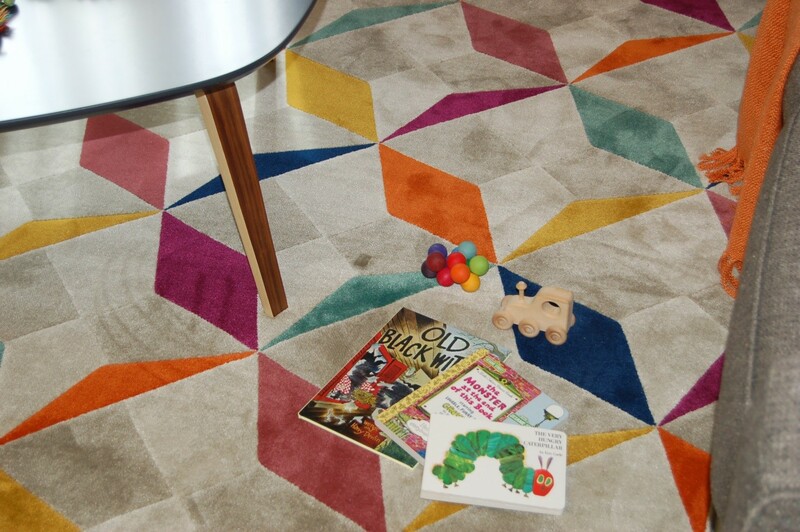 Plush Shag carpet may feel nice on the toes but is a nightmare to get playdough out of. 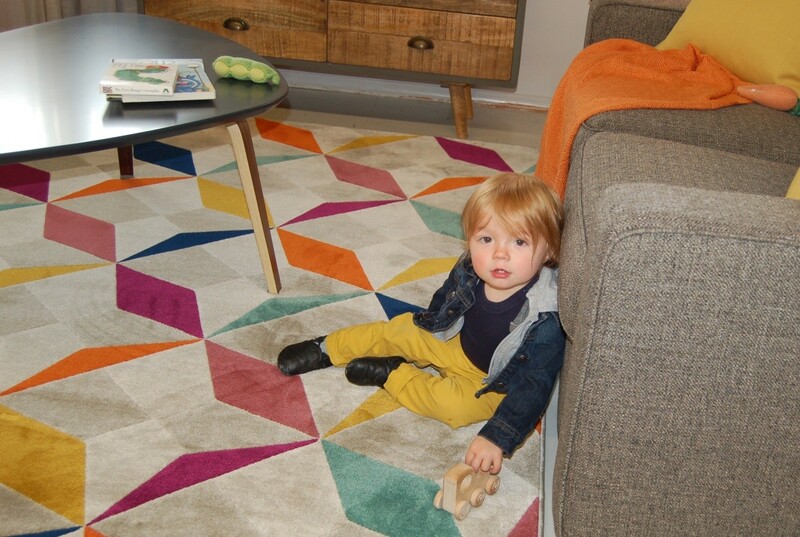 Low pile area rugs can now be found just as soft and trendy as their plusher cousins. What was once thought of as low end carpet is getting a makeover. These softer machine made rugs are usually made of viscose, polyester or polypropylene. They have an incredibly low nap, making them easy to keep clean. A lower nap means food; dirt and debris “sit” on top of the fibers rather than sinking into the abyss of loops and tangled thread. It also means you’ll enjoy your rug for many more years than would ever be possible with shag. Remember the lower the nap the longer the rug will last. There’s a reason why commercial rug applications always have such a low pile. While there are some gorgeous handmade options for soft and cozy area rugs that fit these parameters you’ll also have to have some pretty deep pockets to be able to afford them. The difference in price is reflected by the time it takes to manufacture. Think minutes vs months. It used to be that in order to get a rug that sat nice and flat on your floor you had to go handmade. I’ve never seen a stiff handmade rug after all. Handmade rugs naturally lay flat much better than the traditional machine made rugs. However, we are starting to see machine made rugs with flexible backings. Keep an eye out for thinner backings which allow the rug to “give and relax” rather than having it absorb a memory from being left rolled in a factory for who knows how long. A flexible backing will virtually eliminate the dreaded permanent curl found so commonly on the corners of so many machine made rugs. Accessories always create a finished space. They bring everything together and help to ground a room. Vases, bowls and other home décor pieces used to be synonymous with “fragile do NOT touch” but natural surface materials are starting to take off. Finding pieces made of wood, cork, stone, metal, grass or cloth are gaining popularity. These items come from nature and not only look chic but don’t shatter on impact. As a bonus if you’ve had a wander through your local children’s boutiques you’ll notice this trend lends itself to children’s toys too. There really are some beautiful artisan made toys that you won’t mind sitting out on your end tables because let’s face it they never really make their way back into the toy box. If you still have your heart set on displaying fragile décor don’t fear. Try adding a floating shelf to your room. They offer a safe, sturdy place away from little hands and when your toddler turns into a teenager it’ll make a lovely place to display all those family photos. There really are some good options for today’s parents shopping for furniture and decor. All it takes is a little out of the box thinking and I promise you won’t have to compromise on your home’s style or child’s safety. Your sanity, well I can’t help you with that one but at least you’ll have a beautifully furnished home you can enjoy to yourself. After the kids go to bed that is. 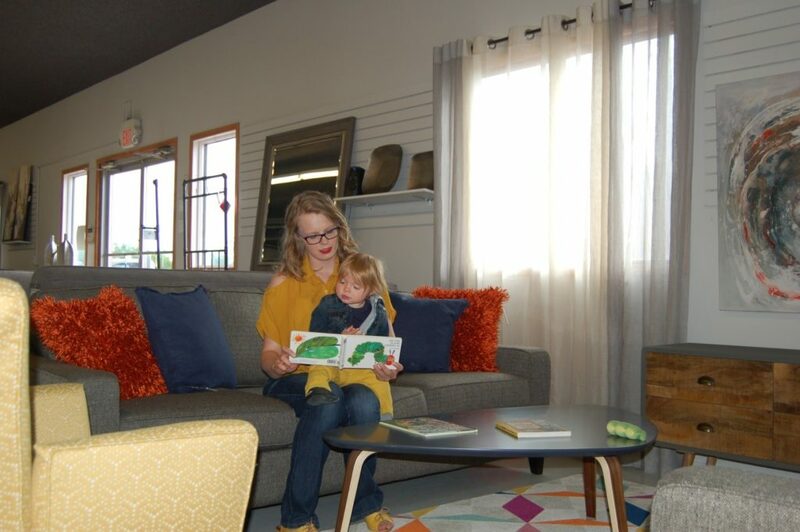 Ashley Baillie is a proud mama bear of one small but mighty bear cub, an avid dog lover, outdoor enthusiast and a sales & design specialist at McMunn & Yates Furniture in Yorkton, Saskatchewan with a passion for creating the right atmosphere that tells your story in any home.